Killer Characters: Need to Get Rid of a Ghost? Need to Get Rid of a Ghost? My name is Lola Van Horn, and I’m the one to call. Of course, I’ll need someone to blow on the candle in the middle of the table so you’ll think I’m actually communicating with the restless souls who are looking to go through life’s portals to the hereafter. You might think this is cruel and call me a phony, but I gotta tell you, when my girl Jordan from the Clueless Cook series asked me to do this for a friend who thought her grandfather’s lake house was haunted, I was hesitant. But she convinced me that her friend would lose her inheritance if we didn’t make her believe there were no ghosts in the house. Sheesh! Halfway through my Academy-Award-winning performance, we were all spooked, convinced that not only were the ghosts there in the room with us, but that they were after us as well. Of course, we all know there aren’t really any ghosts hanging around, don’t we? 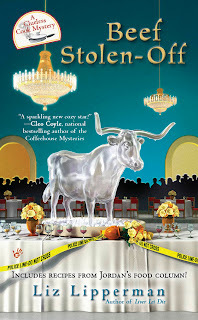 You’ll have to read BEEF STOLEN-OFF to find out what happened. Oooooh! Between your story and the ice sculpture on the cover, I'm shivering! LOL, Willow. It is a fun scene, and I hope you get an opportunity yo check it out. Thanks for commenting. Lola, come on over to my place sometime. 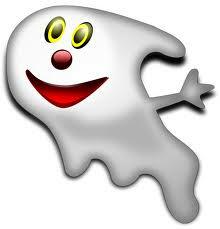 I have a ghost in my kitchen who might make you change your tune about not believing in ghosts! She doesn't blow on candles, but her portrait slips to a slant when she's not happy. Love that, Sophie. Personally, I believe in them--or at least in the concept of them. My sister died at an early age, but before she died, she told me a secret that my other 3 sisters didn't know. I kept that secret until several years after she was gone when my younger sister tricked me into telling it. I swear as I write this that the light flickered when I did. That was the last time I ever told her secret. Then one day I was blogging about it, and the spam word was TESSE. Here's where it gets spooky. My sister's name was Theresa, but we called her Tessie. My ghost in my new series coming from Midnight Ink in May is Tessa. Doo-doo-doo doo. No way I'd call you a phony, Lola. Friendship sometimes demands sacrifices, and a true friend is willing to make them!! Ah, Sparkle, what a nice thing to say. Lola really is Jordan's friend. For those of you who don't know her, she's a seventy-ish psychic with maroon hair and puffed up lips, compliments of a plastic surgeon who gets his tarot cards read once or twice a week. Her boyfriend, a retired cop, lives across the hall from her. I love writing her character.